This installment of the Crawthorne’s Catalog of Creatures series clocks in at 5 pages – the front cover containing the header, creature artwork and the social media icons/homepage of misfit studios. The SRD takes up 1 1/3 pages and the editorial is in a sidebar – to get all the material you thus have to print out the cover with the icons as well. So, what is the storm serpent? Well, in short, it is a CR 10 magical beast that has an interesting assortment of abilities: They can basically cause their bite attack at range via concussive bolts (failing to specify the damage type, alas) and, as a standard action, they may call down vertical bolts of lightning as a standard action, causing “electrical” damage – which should be “electricity”, but I’m nitpicking here. The storm serpent may breathe even in the airless void and is immune to harmful effects of weather and natural environments…which is a bit odd, considering that RAW this makes them immune versus lightning storms, but not lightning bolts hurled at them via a spell. Odd: What about the druidic spells? Do they qualify? Honestly not sure. They also gain an extra standard action, which may only be used to execute attacks and concealment when activating other abilities. As a move action, they may generate difficult terrain within 20 ft. and may maintain a dance that allows them to shift weather patterns “for several days” – okay, how long? I get that this is supposed to be a story-ability, but its execution still leaves something to be desired. As always, we get 3 solid adventure hooks to supplement the critter presented here. Editing and formatting are good, I noticed no severe formal glitches, though tehre are some deviations in the rules-language. Layout adheres to the 2-column full-color standard of the series and while I’m not big on the social icons and dispersal of non-gaming parts through the pdf, from an aesthetic point of view, there is not much to complain about. The pdf comes with the classic Crawthorne-artwork as well as the storm serpent artwork, which is kind of CGI-y, which is not bad per se…however, the artwork does become pixelated on the edges. The pdf comes with a second, more printer-friendly iteration, which is nice to see. The book has no bookmarks, but needs none at this length. 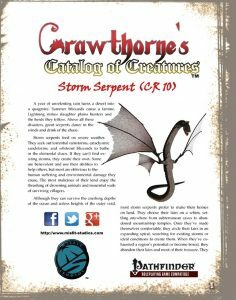 Emily Brumfield’s storm serpent has all the makings of an amazing critter – a bunch of cool and evocative abilities, some neat ideas and a strong theme. Alas, and this weighs heavily on this pdf, the small hiccups accumulate more in it than I would have liked. The glitches are mostly cosmetic, sure – but in a pdf of this size, their presence still baffles me a bit…and at least partially, they influence the mechanics of how the monster works. While by no means bad, the critter thus, alas, does lose some of its appeal to me. My final verdict will hence clock in at 3.5 stars, rounded down for the purpose of this platform. You can get this nice critter here on OBS!